Transferred from Yale University in 1977, from Jane Snyder (for Joan Gotwals) in 1989, and from the David Bishop Skillman Library of Lafayette College in 1995. The photographs were transferred to the University Archives in December 2011 (Accession No. 2011: 070). The Field Notebooks were a gift from Dr. Ann F. Rhoads in January 2013 (2013:007). The papers of John William Harshberger have been organized into six series. They are Personal papers, 1886-1929; Lectures and notes, 1915; Manuscripts, 1925-1929; Publications, 1892-1929; Field Notebooks, 1892-1929; and Photographs, 1918-1928. The manuscripts publications, and photographs have been arranged chronologically. John W. Harshberger was born in Philadelphia on January 1, 1869. He graduated from Central High School of Philadelphia with the degree of Bachelor of Arts in 1888 and entered the University of Pennsylvania the same year. While at Penn, he showed great interest in plant life and received a certificate of proficiency in biology in 1890. During the summer of 1890 Harshberger studied the trees and shrubs in the Arnold Arboretum of Harvard University. In the following fall, before completing his undergraduate requirements, he was appointed Assistant Instructor in Botany at Penn. Harshberger and a group of enthusiastic Penn undergraduates founded the University Naturalists Field Club in 1891. In 1892 Harshberger obtained his B.S. ; he received his Ph.D. the next year. Upon graduation, the University appointed him Instructor in botany, biology and zoology. The University promoted Harshberger to the rank of Assistant Professor in 1907 and Professor of Botany in 1911. 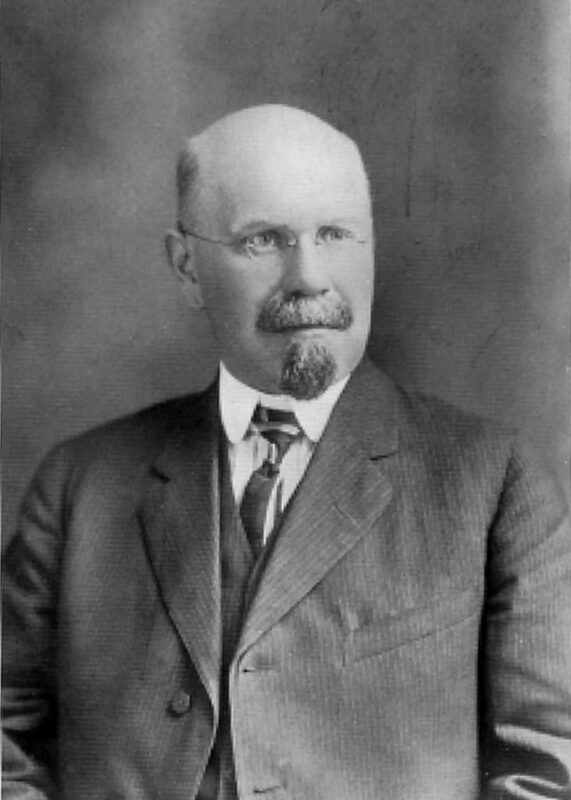 Simultaneously he held teaching positions with the American Society for Extension of University Teaching (1896) and the Pennsylvania Farmers’ Institute (1904-1906). In addition, Harshberger directed the nature study at the Pocono Pines Summer School from 1903 to 1908, the section of ecology at the Marine Biological Laboratory, Cold Spring Harbor, Long Island, for ten summers from 1913 to 1922, and the botanical work of the Maria Mitchell Association on the Island of Nantucket, during the summers of 1914 and 1915. As a botanist, Harshberger traveled widely in North America. He botanized in Eastern and Northwestern states, Southern Florida, Alaska, Arizona, Utah, and California. Overseas, his research trips extended through Europe, Brazil, Argentine, Chile and Mexico. Harshberger was a member of the American Philosophical Society, the Academy of Natural Sciences of Philadelphia, the Philadelphia Natural History Society, the Geographical Society of Philadelphia, and many other academic societies. He served as president of both the Botanical Society of Pennsylvania (1921-1929) and the Pennsylvania chapter of the Wild Flower Preservation Society. He died in 1929. This collection, 1886-1929, primarily documents the professional activities and career of John W. Harshberger, a well-known botanist at the University of Pennsylvania. The Personal papers, though small in size, include several interesting files–Harshberger’s autobiography, a high school catalog, a family photo album and two sets of drawings. Harshberger attached numerous notes and clippings to his autobiography. These attachments contain important biographical and bibliographical information. His high school catalog contains information on Central High School of Philadelphia as well as Harshberger’s grade reports. His career may be traced through his lectures and notes on plant geography and ecology, his manuscripts, and his publications. These publications consist of articles and reprints (1892-1929) as well as monographs (1893 to 1920). Harshberger interleaved many of the monographs with notes and clippings added after the book was published. These represented Harshberger’s new findings from his research and teaching, which he expected to incorporate in future editions. The field notebooks contain his observations on botany while traveling in the United States, and Europe. The photographs consist mainly of negatives of images Harshberger took during this travels in the United States, Europe, South America, and Northern Africa. There are also photographic record notebooks for some of his travels. Other sources: The Botany-Zoology Library of the University of Pennsylvania sent to the Bowman’s Hill Wild Flower Preserve thirteen volumes of bound scrapbooks of Harshberger’s in 1963. The scrapbooks consist in large part of clippings of photographs of various vegetation types. Botanical Society of Pennsylvania. Office of the President. Drawings in water color and pencil, loose sheets, n.d.
Notebooks on animals (3 small volumes), n.d.
Botany as an Avocation, n.d. The Development of Workmanship, n.d. The Plant Geography of Cultivative Land in South-east Pennsylvania, n.d. Recent Scandinavian Work on Phytogeography, n.d. The Vegetation of the Screes, or Talus Slopes of Western North America, n.d.
A Visit to the Native Home of the Atlas Cedar, n.d. The Water-storing Bracts of Mendoncia Coccinea Vell of Brazil, n.d.
New Species of N. A. Dierama n.d. Roll XVII San Diego Calif. Chaparral Point Loma (185-196) n.d. Roll XXXVIII Golden Gate Park and Sand Dunes at Ingleside California (396-406) n.d.
Reading Pennsylvania 1925 September 15 – 16. Negatives SSW 577 to SSW 588 n.d.
No. 1 (1-11 N.S.D.) n.d.
No. 2 (12-23 N.S.D.) n.d.
No. 3 (24-35 N.S.D.) n.d.
No. 4 (36-47 N.S.D.) n.d.
No. 5 (48-59 N.S.D.) n.d.
No. 6 (60-71 N.S.D.) n.d.
No. 7 (72-83 N.S.D.) n.d.
No. 8 (84-93 N.S.D.) n.d.
No. 9 (94-104 N.S.D.) n.d.
No. 10 (105-116 N.S.D.) n.d.
No. 11 (117-128 N.S.D.) n.d.
No. 12 (129-140 N.S.D.) n.d.
No. 13 (141-152 N.S.D.) n.d.
No. 14 (153-164 N.S.D.) n.d.
No. 15 (165-175 N.S.D.) n.d.
No. 16 (176-187 N.S.D.) n.d.
No. 17 (188-199 N.S.D.) n.d.
No. 18 (200-211 N.S.D.) n.d.
No. 19 (212-223 N.S.D.) n.d.
No. 20 (224-233 N.S.D.) n.d.
No. 21 (234-245 N.S.D.) n.d.
No. 21 A (246-257 N.S.D.) n.d.
No. 22 (258-268 N.S.D.) n.d.
No. 23 (269-279 N.S.D.) n.d.
No. 24 (280-291 N.S.D.) n.d.
No. 25 (292-303 N.S.D.) n.d.
No. 26 (304-315 N.S.D.) n.d.
No. 27 (316-327 N.S.D.) n.d.
No. 28 (328-339 N.S.D.) n.d.
No. 29 (340-351 N.S.D.) n.d.
No. 30 (352-357 N.S.D.) n.d.
No. 31 (358-363 N.S.D.) n.d.
No. 32 (364-368 N.S.D.) n.d.
No. 33 (369-374 N.S.D.) n.d.
No. 34 (375-380 N.S.D.) n.d.
No. 35 (381-386 N.S.D.) n.d.
No. 36 (387-398 N.S.D.) n.d.
No. 37 (399-410 N.S.D.) n.d.
No. 38 (411-422 N.S.D.) n.d.
No. 39 (423-433 N.S.D.) n.d.
No. 40 (434-445 N.S.D.) n.d.
No. 41 (446-457 N.S.D.) n.d.
No. 42 (458-468 N.S.D.) n.d.
No. 43 (469-480 N.S.D.) n.d.